Hi there! Just popping in today to share a couple more samples using the latest addition to my Stamping Simply lineup... Trendy Tree Tops. Let me get right to it!... Today, I wanted to focus on the layering abilities of these Trendy Tree Tops images and the coordinating Trendy Tree Tops dies. First up a layered heart tree. I die cut and stamped the heart tree top and layered it over a die cut Melon Berry notched flower (from the soon to be release Notched Flower Die Collection). Die cut a Smokey Shadow trunk and attached. Finished the card off with a sentiment and a gray rhinestone. For the last card of today, I've added a layer of felt. 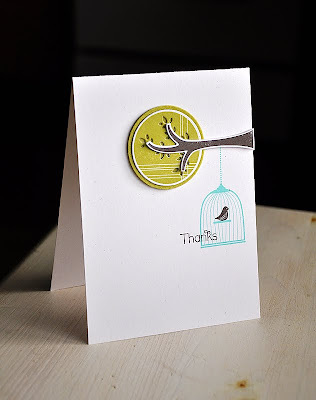 I began this card by stamping the bird cage (from Love Birds) in Hawaiian Shores ink. 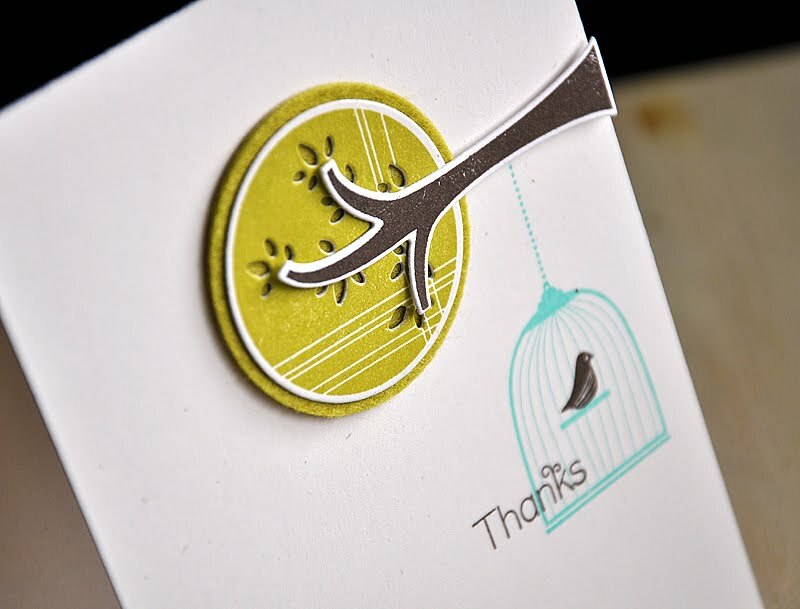 I then layered a Trendy Tree Tops bird and sentiment over the cage. 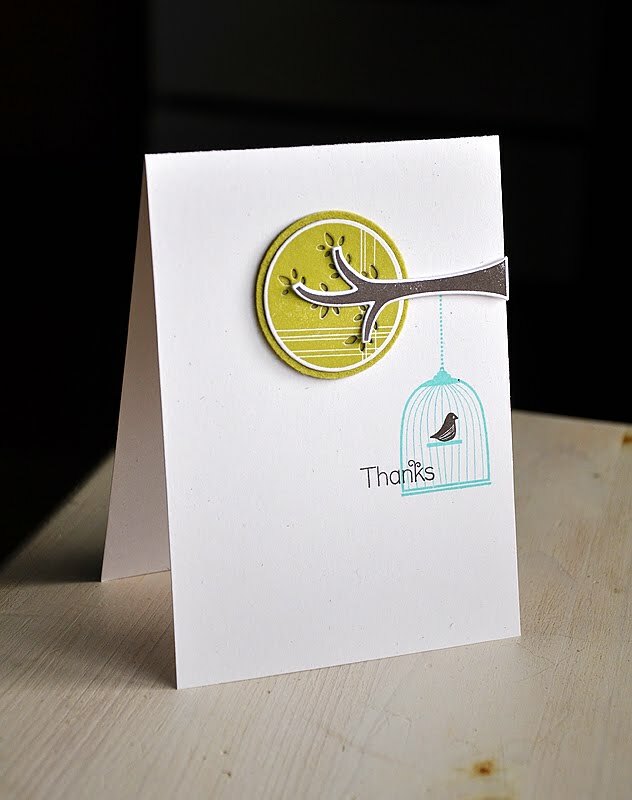 Next, I topped the card off with a layered branch. Here's A Note: The 1 3/4 circle (from the Limitless Layers: 1 3/4" Circle Die Collection) creates the perfect mat layer for any of the tree tops included in the Trendy Tree Tops collection. 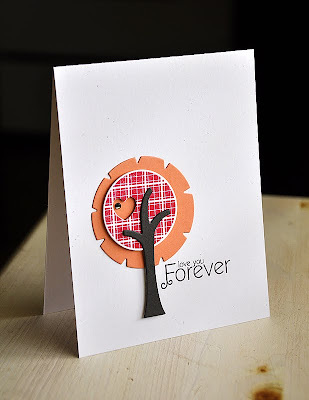 I die cut and stamped both the tree top and branch and attached together. 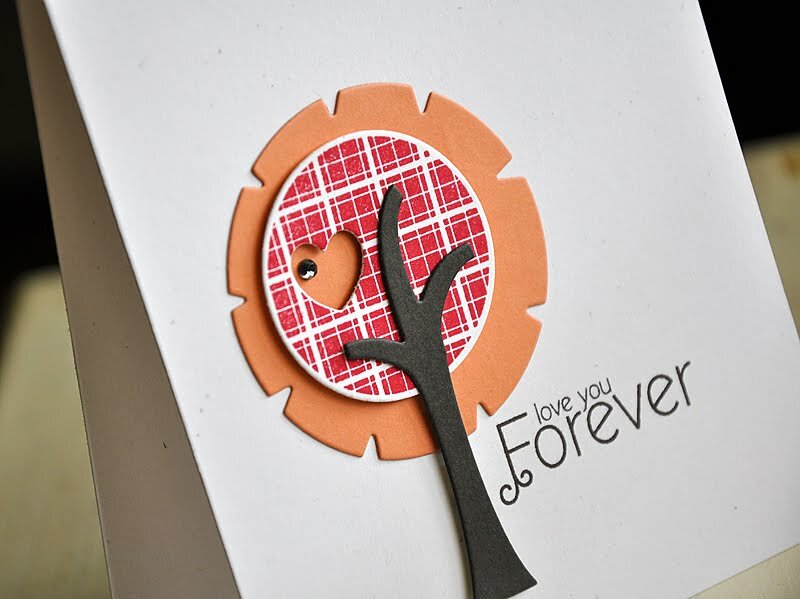 Then layered the tree top over a die cut felt circle and adhered directly to the card base. Well, that's all I've got for you today. Just remember... this set is available for purchase through Papertrey Ink, beginning April 15th, for $15. In the mean time, I'd love to know what you think so far, so please feel free to share! Now, be sure to visit Heather Nichols, Dawn McVey, Melissa Bickford & Lexi Daly. These ladies have peeks to share with you of their newest sets for the month. I am loving the look of the tree tops so far. And the dies that you showed today are fabulous. Can't wait to see more! Dies for Trendy Tree Tops?! How did I miss that one?!! So cute. I love the heart cut out. Those trees get cuter everyday! Simply beautiful, Maile - love how oyu paired up the notched flower die with the tree die - GORGEOUS! Great use of the tree stamp. Very unique. Both cards are just adorable. Those tree dies are super! I love your first card especially, how graphic, and just darn cool! Loved your strawberries card and love the tree tops cards! Wow, you turn something simple to gorgoues craetion. I so impressed how you layered Notched Flower Die with the tree. Simply awesome! Can't wait to see what you create for tomorrow. Love the way you designed the tree top dies to have little cut-outs. Very clever! It's amazing to me how you come up with your ideas to mix and match and make these adorably beautiful cards!! I am really loving this set! The tree tops are great patterns and the dies are intriguing (can't wait to see the reveal). what do i think... YOU are awesome!! i can't wait! love it all girlie!! Wow, Maile, I love the classic look of these beautiful cards!! Wow-all those cards are AMAZING!!! Magnificent! The layering is great. The Korean rhinestones can be added to become more attractive and exciting. Thanks for sharing your ideas. Keep it up.